Meteorites have a dubious beginning, requiring a good deal of speculation about where they actually originate. As we see it today, the most popular loitering spot for fragments of burst planets and odd shaped heavenly bodies is the asteroid belt that lies between the orbits of the planets Mars and Jupiter. Due to its tremendous gravitational pull, Jupiter is thought the scapegoat for the probable destruction of a young planet forming along with the other misty, twirling orbs in our blossoming solar system. Spectrum analysis has played a part in comparing distant asteroids within the belt and fragments having pocketed our planet, which indicates a close relationship. However, the variations between the innards of these numerous long term visitors shows that they are from different families from parts unknown, and not only from the festering incestuous relationship between the bits and pieces encircling our first four planets. Meteors are the fiery travelers through our atmosphere, which come to rest as meteorites. They fall at what is estimated to be around 100,000mph, passing through for several superheated seconds. This leaves a blackened surface less than a millimeter thick. Other effects will be discussed shortly. Meteorites come in three basic flavors: stony, iron, and a mixture of both. Those composed of rock (and other minerals) are called chondrites, and are the most common of the meteorites that strike the Earth (and presumably other forlorn satellites in their way). These are recognizable by their black covering, but if left to the unconcerned elements, this will fade, making these space travelers unrecognizable to the discerning eye. Within are mixtures of elements, a few of which, as in the case of the Allende meteorite of Mexico, hold some secrets to the beginning of our universe. Significantly rarer but more easily found are the irons, which always lose with magnetic hide-and-seek. Presumably from the center of a shattered planet, these constitute a majority of large falls, as in those in America (Canyon Diablo), Africa (Gibeon), Russia (Sikhote-alin) and South America (Campo del Cielo). Aside from the blackened surfaces, the extreme heat of entry causes some vaporization or ablation of the surfaces, leaving little whittled dips and cups here and there. As a result, some travelers appear to be compelling, small cosmic works of modern art. The insides often show intriguing crystalized patterns when washed with a light acidic mixture. Iron and nickel crisscrossing spines are exposed on these etched surfaces, called Widmanstatten lines, with variations in crystal size depending on its composition. Mixed or stony-iron meteorites make up about 1% of finds. 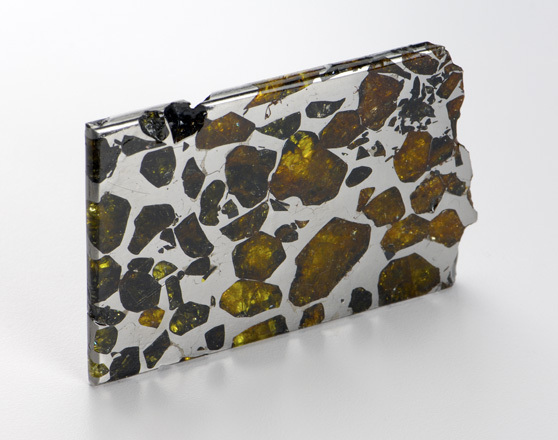 This interplanetary mantle, known collectively as pallasites, are dark visitors which are most impressive when dissected into thin, polished slices. The silvery sheen of the iron nickel surfaces provide the setting for the beautifully inset green olivine crystals called peridot. Notable examples include falls in China (Fukang), the US (the somewhat unstable Brenham) and the superior Esquel from Argentina. 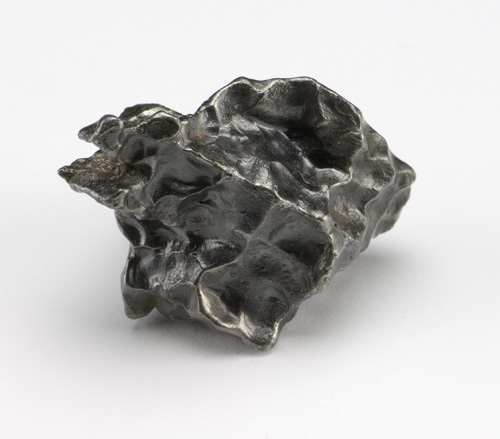 Values of meteorites vary, depending on their stability, rarity, size, weight, and eye appeal. Some unstable meteorites quickly rust into hopeless abandon, leaving little to admire, such as the Brahin or Campos. For this reason, these command a lower price. The number of individual meteorites or size of the fall plays a big role in price, such as the bountiful Gibeon and Sikhote-alin. 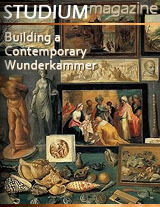 Also, the larger the piece or the aesthetic appeal of its display will also affect its collector value. Just be certain to buy from a reliable source. This writer has been to gem shows in California and seen painted black pebbles marked for sale as meteorites. The vehicles of greed have no governor. Generally, meteorites are sold by the gram (28.3 gm/oz), with more common examples (Gibeon, Sikhote-Alin, Campo del Cielo) in the $2-$3 range up to the scarce Esquel pallasite commanding $48 per gram. Significantly higher prices are had for meteorites emanating from Mars or the moon.